The British Shorthair is a very sturdy, medium to large cat. The body is semi-short, muscular, and powerful, giving a stocky-heavy appearance. The head is broad, massive, and round. Chubby cheeks give a chipmunk appearance and their large copper eyes are wide set. The nose is short and snub, with a wide muzzle. 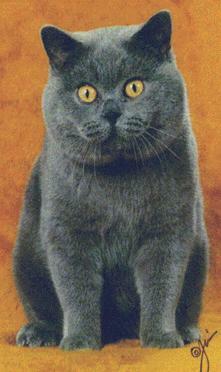 A British Shorthair is known for its uniqueness in coat. It should be firm, crisp, with the texture and density of fine velvet. The announcement of my retirement was premature. I am cutting back a bit and will be producing fewer litters a year, but am not retiring.